Still not comfortable with this difficult stitch, I worked few more samples and completed this sampler. but Iam still in the learning process of this stitch. 4. 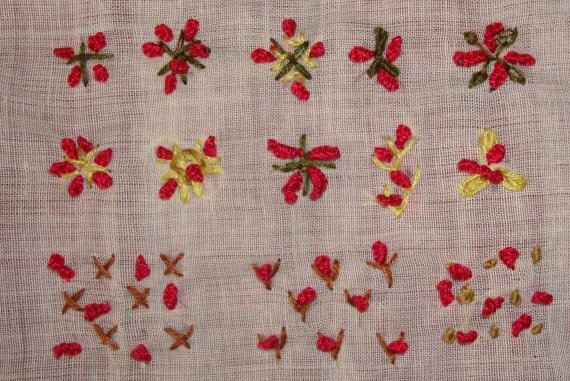 The first motif is worked with buttonhole wheel surrounded by drizzle stitches. In the next sample, whipped wheel and drizzle stitches are worked together. 5. The borders are worked in drizzle stitches, basque stitch and bonnet stitch combinations. The four individual drizzle stitches are outlined with buttonhole, stem, chain and running stitches. The next two are worked with beads. 6 the first one is drizzle stitch with Palestrina knot, in the second sample, the drizzle stitches are worked inside fly stitches, the third sample is Pekinese stitch and drizzle stitch combination. Though a great dimensional stitch, it is not an easy stitch to work, even after putting in lots of effort towards, casting on and repeated threading , the stitch placements were not under my control, that really frustrated me. But I had a good practice of this stitch. The 38th week stitch of the TAST 2012 challenge by SharonB is drizzle stitch. I had conveniently missed this stitch during the previous TAST challenge. It is a difficult stitch, both the casting on stitches and threading the needle took all my attention, that I did not care how the stitch turned out. This sampler is about drizzle stitch practice and not exploration. This stitch is worked with other stitches. 1. 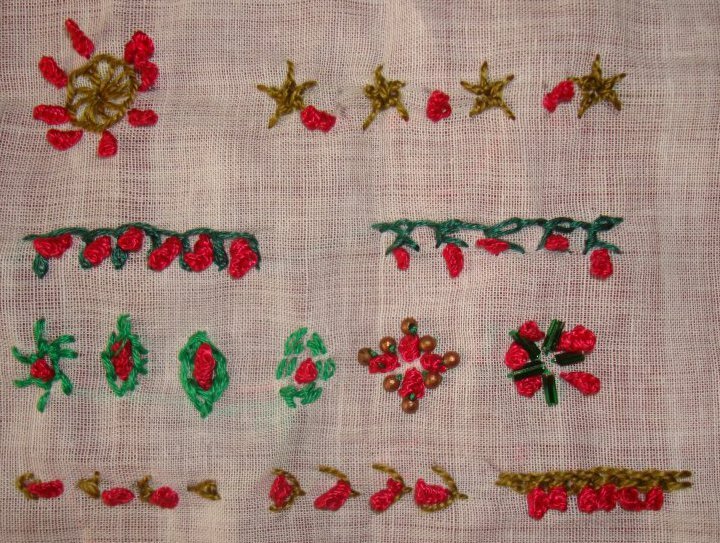 The first one is worked with upright cross stitch, the second one with Algerian eye stitch, the third one with cross stitch, the fourth one with three bullion and the last one is worked with detached chain stitches. 2. The stitch combinations in this row are- fly stitch, herringbone, Palestrina knot, feather stitch and oyster stitch. 3. In this part of the sampler, the drizzle stitches are worked with other stitches as filling. Cross stitches, fly stitches and French knots.